Exciting news! This week Gardivalia Festival of Gardens received a $3000 Baw Baw Shire Council Community Development Grant to upgrade our website. We will now have interactive maps with our open gardens and many other new features to make it easier to manage the site and to make www.gardivalia.com.au more attractive to our viewers. Thank you Baw Baw Shire Council! 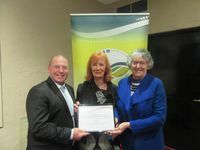 Pictured below is Mayor Joe Gauci presenting the award to Gardivalia president Jan Wishart and Gardivalia secretary/publicity officer Maree Wallace.